Crop insurance program is more efficient, effective than ever before. 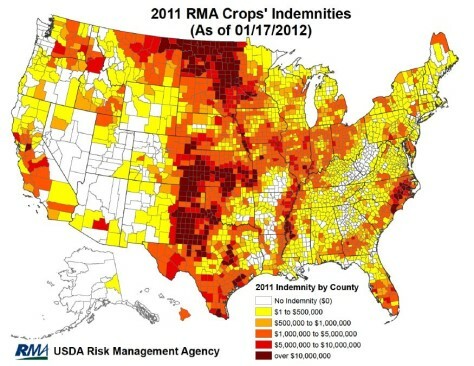 Crop insurance companies already have paid $9.1 billion in indemnity payments to U.S. farmers for 2011. That's a new record and actually the largest loss claims in the history of the program according to USDA's Risk Management Agency. And only 81% of claims have been finalized. Former USDA Chief Economist Keith Collins says during the past four years more than $27 billion in private-backed crop insurance has been paid to farmers affected by market drops or natural disasters. At the same time, however, Collins says Congress has reduced the federal investment in crop insurance by more than $12 billion. "With those large loss claims, with the funding cuts in the program, we now have a program that's being delivered probably more efficiently and effectively than ever," Collins said. "I think we have to be very careful in the 2012 Farm Bill to not do damage to the heart of this program and that is the delivery and the infrastructure. Farmers say this is their most important program, they want this program and without a sound crop insurance program with a capable and effective delivery structure there could be big problems in agriculture if we don't have this effective protection in place." Collins says producers are doing anything and everything they can to meet domestic and global needs for food, feed and fuel. This year Collins says there are 264 million acres covered by crop insurance. The growing demand has caused commodity prices and land values to continually spike and he says increased planting means a higher demand for crop insurance. "So the large acreage and high prices combined to increase the liability insured value of the crops by quite a bit," Collins said. "As that value goes up that increases risk exposure of both farmers and the companies that deliver the program. And then when you have bad yields like we had in 2011 the result of that then is very large loss claims; billions of dollars in damages and that really shows the value of crop insurance to American agriculture." That's because without payouts Collins says producers wouldn't have the means to pay their bills and their bankers, lenders, input suppliers and others associated with their operations would all share in the losses without crop insurance to fill that gap. Corn, cotton and wheat, just three of more than 128 crops covered by crop insurance last year, account for 70% of the indemnities paid so far. Informa projects the 2012 U.S. corn crop will increase to 94 million acres planted from 92.3 million acres planted in 2011. From previous statistics at least 80% of eligible acres should be protected by private-backed crop insurance policies.